Korean pop group Brown Eyed Girls made their official debut in Japan through a showcase on Friday, according to a press release by their agency Nega Network. The four-member group celebrated their upcoming record release in the country by holding a showcase at Astro Hall in Tokyo on August 6, performing in front of some 1,000 fans at the sold-out event. After teaching the fans how to do their so-called 'arrogant dance routine,' the girls sang a total of five songs at the showcase including the Japanese version of their smash hit "Abracadabra" and "Sign." The quartet has been readying for their Japan debut since signing with major record label Sony Music Japan International earlier this year, and will be kicking off their activities later in the year. Brown Eyed Girls is composed of leader Jea, rapper Miryo and vocals Narsha and Gain. They debuted in 2006 with album "Your Story" and have since released two more studio albums and two mini-albums. 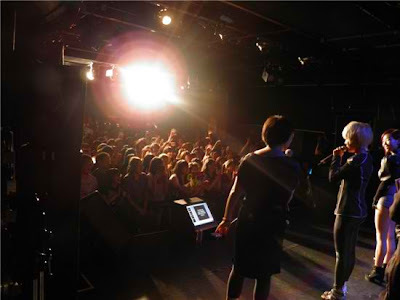 Their latest record "Sound-G", released in July 2009, produced the hit single "Abracadabra" which swept various K-pop music charts last year. The band's official Japanese debut album "Sound-G," featuring the local version of "Abracadabra," will be released on August 25.